Line-X Williston: Who Can Benefit From Our LINE-X Services? The Alpine Team Explains! LINE-X is designed to provide lifelong protection for your vehicle, but this industry-changing product can be tailored to deliver the best support for nearly any surface. As long as it holds an electrostatic charge, the experts at Alpine Truck Accessories can help! Our local truck shop has worked for years to stock the best aftermarket truck parts and services to help your ride retain its shine after the heaviest use. Our team also provides grilles, fender flares, winches, roof racks, lights, side steps, and more to completely protect your truck with a rugged look. Our team is proud to provide authorized LINE-X services to Williston drivers, outfitting every vehicle to take on the worst without bending, breaking, peeling, or bubbling. While our spray-on bedliners are intended for work trucks, there are many professions who can benefit. Catch up on a few uses for our LINE-X sprays before contacting our team for assistance! Originally, LINE-X spray-on liners were developed to provide complete protection for work trucks. The bed of your vehicle is tasked with storing all of your gear, and day after day of use will likely result in the need for a replacement. LINE-X is tailored to bond to your vehicle at the chemical level, ensuring a perfect fit that cannot be beat for durability and reliability. Prevent stains, scratches, and corrosion for a lifetime with the rugged quality of this product, applied by our experts. Alpine Truck Accessories is here to deliver the best result for your work truck. Our LINE-X coatings and drop-in bedliners ensure that your vehicle is equipped and ready to shine after years of use. No other product lasts like LINE-X, and no team in North Dakota can provide the same result as the Alpine Pros. The quality of LINE-X can be seen in the trust placed in it by watercraft enthusiasts. Boats of all shapes and sizes can benefit from the solid impact resistance and added sealing measures of this spray-on coating, which has been shown to greatly enhance the protection against leaks. While this spray isn’t a solve-all for your boat, it may be the perfect addition to keeping your hull in perfect condition! LINE-X can also be useful for those who are looking to live life on the open road. RVs are ideal for this adventure, providing all of the amenities needed for comfort while covering mile after mile. Distance travellers are tasked with maintaining their high-value ride to keep all damages and moisture at bay. Our truck shop can provide the LINE-X sprays to coat each component to seal water out and protect the exterior surfaces from the dangers of the road. Taking on the trails across North Dakota is no easy task. Off-road junkies and hunters alike can outfit their vehicles with a LINE-X coating for the best protection, no matter what the trail throws at them. Branches, steep hills, and errant rocks all have the potential to create a nasty surprise for you and compromise the beauty of your ride. Drivers making the trip to Minot or Cartwright should know the dangers and plan ahead. It pays to be safe for both you and your truck. If you frequently put your vehicle under stress in these high-scratch environments, Alpine Truck Accessories is here to help! Our spray-in bedliner services can be utilized to protect the truck accessories and parts you are worried about damaging. In some cases, off-road enthusiasts have covered the entire bottom of their trucks in LINE-X, delivering exceptional scratch and impact resistance that can keep moisture and corrosion out. You invested a lot of time and money into your truck, and when the time comes to kick it into four-wheel drive, you’ll be happy you invested in protection from our truck shop. 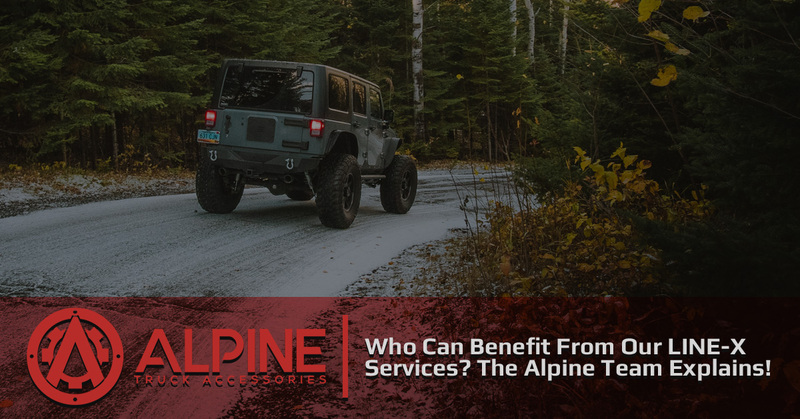 Alpine Truck Accessories is here to deliver the best products and outcomes for every customer who walks into our shop. We specialize in delivering rigid outcomes for every task, and our experts will be happy to help you find the best protection for your fleet. Customers in need of professional LINE-X services in Williston or the surrounding areas can stop by our truck shop on 1st Street East, call us at 701-826-2000, or contact us online for assistance!